[Table of Contents]People old and young enjoy waxing nostalgic about and learning some of the history of early electronics. Tower Radio was published from through . All copyrights are hereby acknowledged. This 1934 edition of Tower Radio magazine was thrown in with a batch of vintage radio magazines I bought on eBay. Most of the content pertains to entertainers of the day rather than with technical issues. Reportedly, it was only sold at Woolworth's stores. Ironically, the number of households with over-the-air (OTA) radio listeners today, at least as a percentage of the population if not in absolute numbers, is probably about the same as in 1934 when commercial radio broadcasting was just getting a foothold. These days, many - if not most - people listen to radio and podcasts via cellphone and/or Internet streaming media than from over-the-air broadcasts, even while in their cars. Organizations like the National Association of Broadcasters (NAB) are trying to change that, but it's an uphill battle. I tune in to OTA when possible, but with my radio sitting close to the computer with all the EMI it spews, it is nearly to impossible to get a clean AM signal. At the bottom of the page is an article from the same edition of Tower Radio telling of Admiral Byrd's mother monitoring his broadcasts from his expedition's Antarctic camp. 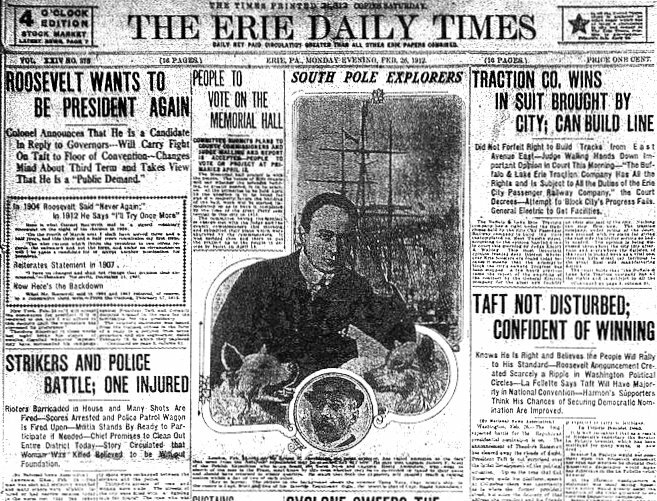 Also, by chance when I posted this on February 26th, a "Day in Erie's History" featured in a 1912 edition of The Erie Daily Times newspaper with a lead story about Antarctic exploration. Admiral Byrd's expeditions were not until the 1930s, so it was not about him. 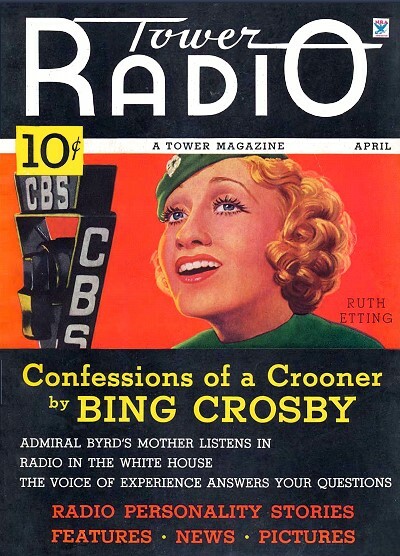 A 1934 issue of Radio News magazine, a contemporary to this one, ran an article titled, "Listening to Byrd on Short-Wave Radio." It went into the details of Byrd's radio installation and encouraged amateur radio operators to monitor and report communications. At one point Admiral Byrd spent five months alone at his outpost with his radio being his only connection to the rest of the world. Do you know how to get the most out of your radio? This series will tell you how to avoid hit and miss listening. Do you know how to listen to radio? Are you getting the most value from the great mass of programs of every conceivable type and all scores of subjects that are offered on the air each day? Do you dial at random or do you intelligently select your programs? Perhaps you have given up tuning in regularly because your haphazard trip along the airways has produced unsatisfying results. It may be your conviction that the broadcasters give little heed to the hobbies and topic in which you are interested. I have just won over to the ranks of listeners a man who steadfastly refused to have a radio in his home because he declared there was "nothing but jazz on the air." He happens to be an ardent stamp collector and when I proved to him that there were programs devoted to the philatelist he promptly purchased a set. There will always be "nothing but jazz on the air" for the random dialer who dislikes syncopated rhythm just as there will be the plaint of '"too much talk" by the set owner who searches no further than the dial knob for his preferences. Veritably, there is something for everyone. Majority as well as minority tastes are provided for each day on the radio bill of fare which the chain and independent stations serve. No one need go hungry, no matter how captious the radio appetite. He who seeks will find. In this, the first of a series of articles on the proper way to listen to radio, we shall endeavor to assist the reader in discovering the good things that are free as well as to induce him or her to become a selective rather than a random listener. As cooking is first and foremost in every home, we will center our attention on that topic and search out what the air waves have to offer. Next month we will take up the timely topic of home service. As a premise it may be stated that the sponsors and broadcasters are quite alert to the specific and general desires of the radio audience. Throughout the day and evening, programs of infinite variety are spotted to meet the varying tastes of the listeners. Hence the reason is apparent why the "fan" should plan his listening hours, otherwise he is certain to miss features in which he is especially interested. In the category of cooking, which we are considering, the stations and advertisers offer programs of great benefit to the woman who would listen and learn. These features, heard on the chains of the National Broadcasting Company and the Columbia Broadcasting System, as well as individual stations, do not, as a rule, run consecutively but are put on at various times of the broadcasting day. Those who, like myself, plan their listening moment, find the period by period timetables published in newspapers and some magazines of inestimable value. They read over item by item the offerings on the various stations on which they get good reception and then check off or write down programs holding forth promise of interest and enjoyment. The intelligent '"fan" also reads radio publications and columns for new, of forthcoming features, in order not to miss out. Adopting this method. let us proceed to find out what the networks offer the woman who wants to be up to the minute in culinary modes and developments. On Monday, Wednesday and Friday each week at 11 a.m. Eastern time, which will be given in all cases, Mary Ellis Ames and the cooking staff of the Pillsbury Flour Mills are heard over a Columbia network in "Cooking Close-ups." 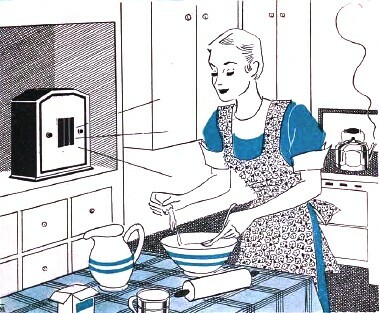 To add a touch of realism to her program, Miss Ames, who is regarded highly as a cooking authority, puts on the broadcast from the experimental kitchen of Minneapolis. Thus in the proper atmosphere Miss Ames gives her talk, bringing out new and appetizing recipes and suggestions in the direction of short-cuts in the day's routine at home. Frances Lee Barton, cooking expert for General Foods, is worth listening to each Thursday morning at 11:15 over an extensive WEAF-NBC hook-up. Miss Barton lends conviction to her talks on food preparation by actual demonstrations before the microphone while she is on the air. Both a National Broadcasting Company and a Columbia network are utilized by the manufacturers of Davis Baking Powder to present a Scotchman by the name of MacPherson who elects to give the results of his culinary excursions under the program heading of "The Mystery Chef." In his informal talks, this entrepreneur of good things to eat, reveals his cooking secrets as well as clever kitchen tricks he has developed. "The Mystery Chef" is heard each Tuesday and Thursday morning at 9:45 over the Columbia chain and on Wednesday and Friday at 9 a. m. over a WJZ-NBC web. Continuing further our selective listening schedule on cookery, let us remember to tune in on Columbia on Thursday morning at 10:15 to hear Ida Bailey Allen, founder of the National Radio Home Makers Club. Mrs. Allen, who maintains a laboratory "home" atop a New York skyscraper, gives her radio audience the benefit of her experiments in national and international cooking. And on Wednesday and Friday at 10:45 a.m. we must not forget to hear Betty Crocker give her cooking talks under the aegis of General Mills over the red network of the National Broadcasting Company. Cooking demonstrations by the Pet Milk Kitchen are available to the woman at home over a Columbia hook-up each Tuesday and Thursday at 11 a.m. Then, too, Jane Ellison's Magic Recipes, a dramatized program of household advice and cooking short-cuts, may be heard every Wednesday at 11:45 a.m. over the Columbia Broadcasting System. If you missed Josephine Gibson and her hostess counsel talks, during the Fall and early Winter, be assured now that she is back on the air. Every Monday, Wednesday and Friday, she is to be heard over the National Broadcasting Company chain. Miss Gibson broadcasts from the Heinz auditorium in Pittsburgh, Pennsylvania, where she gives suggestions for unusual recipes, particularly for an entertaining hostess. Because of the national distribution of TOWER RADIO, we purposely have reviewed only the programs carried by the National Broadcasting and Columbia chains. There are many regional and local programs dealing with the subject of cookery. These worth-while programs the listener will ferret out in his time table study. Yes, radio provides recipes. The cook books of the air daily solve the vexing problem: "Wha! shall I have for dinner tonight?" So let's study the timetables and listen to what the experts have uncovered in their laboratory to provide us with epicurean delights. There was another article that I thought of after I had disposed of my copy of Tower Radio, and that's this one about Admiral Byrd's mother listening to his broadcasts from the Antarctic post during her son's expedition. Fortunately, a copy of the magazine is on the Old Time Radio Researchers Group website.